WASHINGTON, D.C. -- Fewer Americans are satisfied with the freedom to choose what they do with their lives compared with seven years ago -- dropping 12 percentage points from 91% in 2006 to 79% in 2013. In that same period, the percentage of Americans dissatisfied with the freedom to choose what they do with their lives more than doubled, from 9% to 21%. Gallup asks people in more than 120 countries each year whether they are satisfied or dissatisfied with the freedom to choose what they do with their lives. 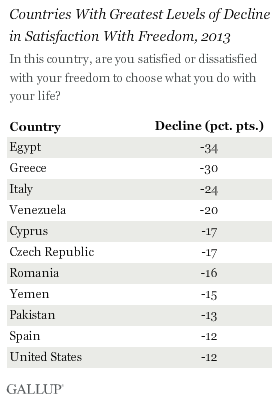 In 2006, the U.S. ranked among the highest in the world for people reporting satisfaction with their level of freedom. After seven years and a 12-point decline, the U.S. no longer makes the top quartile worldwide. Of the countries where Gallup asked residents about satisfaction with their freedom in 2006 and 2013 (108 in total), only 10 countries had declines as large or larger than the decrease seen in the U.S. The decline in perceived freedom among Americans could be attributed to the U.S. economy. Many Americans continue to lack confidence in the economy and see it as one of the biggest problems facing the country. On the other hand, there are signs that Americans' attitudes toward the economy are improving. Compared with the days after the economic recession, Americans are feeling better about the national economy, spending habits in the U.S. have nearly recovered, and U.S. self-reported job creation has rebounded, if not improved. Although unclear, the decline in perceived freedom could be more than just economics. Another possible explanation for the decline in freedom is how Americans feel about their government. 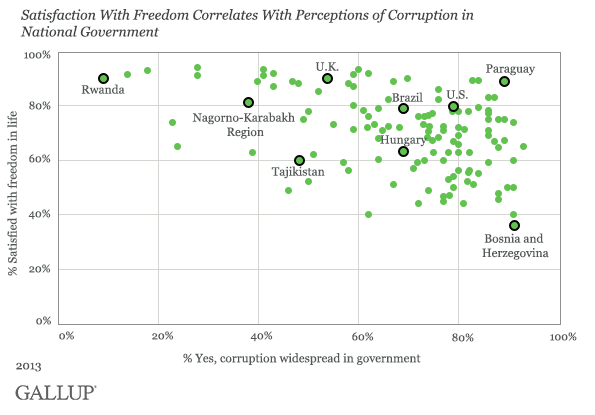 Gallup asks an additional question worldwide about whether people believe corruption is widespread throughout their government. This item is related to perceptions of freedom at the national level. Among Americans, perceptions of widespread corruption in their government have been generally increasing over the past seven years. Perceived widespread corruption in the U.S. government could be on the rise for several reasons, including the significant media attention on issues such as the IRS targeting of conservative groups and the National Security Agency leaks. Americans not only feel that the U.S. government is performing poorly, as demonstrated by record-low congressional approval ratings, but they also report that the U.S. government itself is one of the biggest problems facing the country today. Americans will no doubt be celebrating their freedom this Fourth of July. However, leaders in the U.S. should be aware of a growing number of Americans who are dissatisfied with the freedom in their own lives. While freedom means many things to different people, one underlying cause for this sentiment seems to be how people feel about their national government. Results are based on face-to-face interviews with approximately 1,000 adults in each country, aged 15 and older, conducted between 2006 and 2013. For results based on the total sample of national adults, the margin of sampling error ranged from ±1.7 percentage points to ±5.8 percentage points at the 95% confidence level. The margin of error reflects the influence of data weighting. In addition to sampling error, question wording and practical difficulties in conducting surveys can introduce error or bias into the findings of public opinion polls. President Barack Obama's job approval rating averaged 41% last week, a notable decline from highly stable ratings of around 44% since mid-March, and just one percentage point above the lowest weekly average for his presidency.